Easy to Learn Korean 1498 – Buying seasonal fruit (part two). Easy to Learn Korean 1138 – Seasonal food (part two). Posted in Series	| Tagged and lotus root are currently seasonal foods., and pumpkin are at their nutritional peak in November., apples, burdock, lotus root, oysters, pumpkin, Roots are in season in the winter., seasonal foods., Which vegetables are in season this month?, Yam, 겨울에는 뿌리채소가 제철이에요., 굴, 마, 배추, 사과, 어떤 채소가 이달의 제철음식 인가요?, 연근, 연근이 요즘 제철음식이에요., 우엉, 호박, 호박은 11월에 영양이 최고조에 이르러요. Easy to Learn Korean 1137 – Seasonal Foods (part one). Posted in Series	| Tagged Apple, clam, cockle, Half-dried Pacific herring, Maintain your health by eating seasonal foods., minerals, nutrition, omega 3, oyster, seasonal foods., vitamins, white radish, 과메기, 굴, 꼬막, 무, 미네랄, 비타민, 사과, 영양, 오메가 3, 제철 음식, 제철음식의 섭취로 건강을 지키세요. 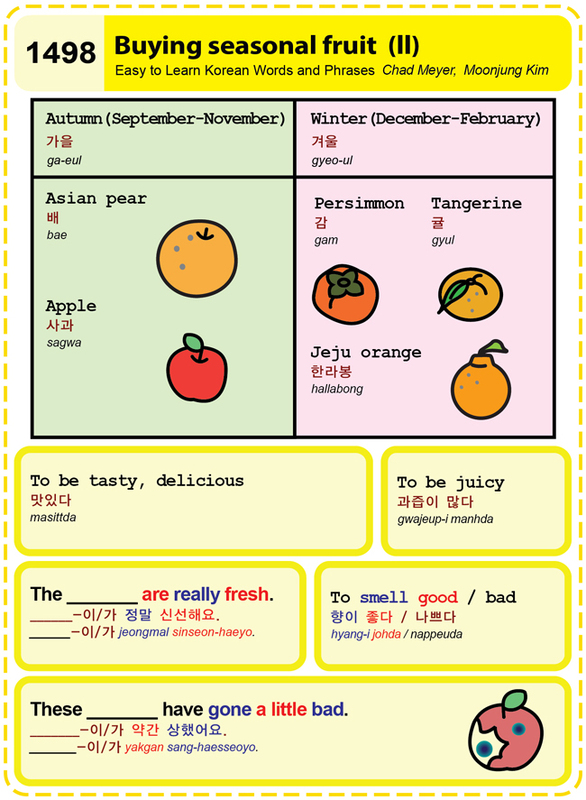 Easy to Learn Korean 1088 – Seasonal fruit.